As we are welcome a brand new month of July 2017, send special happy new month messages/SMS/Text and greetings to your friends, clients relatives and loved ones. Here are great collections of New Month Greetings, New Month Wishes, New Month Quotes, New Month Poems, New Month SMS, New Month Text and lots more you can send to friends and family. 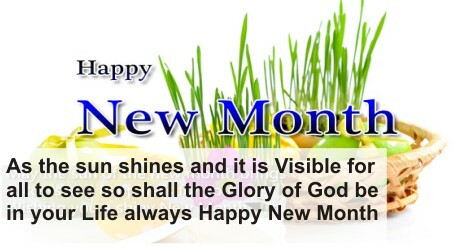 Choose from these collections of New Month Messages to send good wishes to your near and dear ones. Welcome to the month of #MONTH#. Congratulations to d next level. Stay Blessed. THAT SAME GOD WILL CHANGE UR STATUS FOR LIFTING THIS MONTH. Welcom 2 d month of OCTOBER. grace n favour in dis new month. and it shall be well with U Amen. breakthrough too big to explain. may ur estimatns & intentns 4 d days ahead stay firm IJN. and ORDAIN 2 be will not turn into VAIN. days into weeks and weeks into months. And gradually this year is ROLLING OUT! good health and prosperity to you before this year ROLL out! Every sunrise gives us 1 mor dy 2 hop! so sal u MARCH tru dis month & gada biesin beyond ur expectation IJN. Happy new month. let God n c hm work tinz out. Loading.. 10% 50% 100% Done! ur month of fulfilment%new beginning.